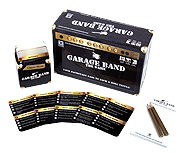 Garage Band: The Game(TM) is your backstage pass to rock and roll trivia, featuring pop, classic and country rock musicians from the '60s, '70s and '80s. Four clues are given to describe a famous musician or band. The fewer clues needed to guess the answer, the higher the score. Famous musicians include The Kinks, Black Sabbath and Def Leppard, to name a few.